The 2000 World Series was the championship series of Major League Baseball's (MLB) 2000 season. The 96th edition of the World Series, it was a best-of-seven playoff between crosstown opponents, the two-time defending World Series champions and American League (AL) champion New York Yankees and the National League (NL) champion New York Mets. The Yankees defeated the Mets, four games to one, to win their third consecutive championship and 26th overall. The series was often referred to as the "Subway Series", referring to the longstanding matchup between New York baseball teams; it was the first World Series contested between two New York teams since the 1956 World Series. Yankees shortstop Derek Jeter was named the World Series Most Valuable Player. The Yankees advanced to the World Series by defeating the Oakland Athletics, three games to two, in the AL Division Series, and then the Seattle Mariners, four games to two, in the AL Championship Series; it was the third consecutive season the Yankees had reached the World Series, the fourth time in the past five years, and the 37th overall, making it the most of any team in MLB. The Mets advanced to the World Series by defeating the San Francisco Giants, three games to one, in the NL Division Series, and then the St. Louis Cardinals, four games to one, in the NL Championship Series; it was the team's fourth World Series appearance, making it the most of any expansion franchise in MLB and the Mets' first appearance since winning the 1986 World Series. The Yankees were the first team in baseball to win three consecutive championships since the 1972–1974 Oakland Athletics, and the first professional sports team to accomplish the feat since the 1996–1998 Chicago Bulls. Although the Yankees were in the midst of a dynasty and not far removed from their dominant 114-win 1998 season, the 2000 season was their weakest performance since 1995. They won just 87 games in the regular season and lost 15 of their last 18 games, closing 2000 with a seven-game losing streak. Many players who were great in 1998 (Tino Martinez, Paul O'Neill, Scott Brosius, Chuck Knoblauch, and David Cone) had below-average seasons in 2000. Highlighted by MVP-caliber seasons from Edgardo Alfonzo and Mike Piazza as well as strong pitching performances from Al Leiter and Mike Hampton, the New York Mets won 94 games in the regular season to capture the Wild Card by 8 games (though they lost the NL East to the Atlanta Braves by 1 game). By winning the 1999 and 2000 Wild Card, the Mets achieved their first back-to-back post-season appearances in franchise history, a feat they would match in 2015 and 2016. The Mets defeated the 97-game winning San Francisco Giants in the NL Division Series, 3–1, and the 95-game winning St. Louis Cardinals, 4–1, in the NL Championship Series. The 2000 World Series was the first World Series appearance for the Mets since their championship in 1986 and their second post-season appearance since 1988. The opener fell on two anniversaries. Twenty-five years prior, Boston Red Sox catcher Carlton Fisk ended Game 6 of the 1975 World Series with his famous home run off the left-field foul pole in Fenway Park to beat the Cincinnati Reds and force a Game 7. Twenty years prior, the Philadelphia Phillies won their first World Series title, defeating the Kansas City Royals in six games. Game 1 was a match-up between postseason veterans Al Leiter and Andy Pettitte. Both pitched scoreless ball until the sixth inning when David Justice's two-run double put the Yankees on top. In the top of the seventh inning, the Mets loaded the bases off Pettitte with one out on two singles and a walk before Bubba Trammell tied the game with a two-run single to left. After Timo Perez's sacrifice bunt moved up the runners, Jeff Nelson relieved Pettitte and allowed an RBI single to Edgardo Alfonzo to put the Mets on top. However, in the ninth, the Yankees tied the game on Chuck Knoblauch's bases-loaded sacrifice fly against Mets closer Armando Benítez. With the bases loaded, José Vizcaíno drove in Tino Martinez in the 12th inning against Turk Wendell with his fourth hit of the game to win it for the Yankees. Roger Clemens started for the Yankees. Earlier in the year, during Interleague play, Clemens had hit Mets catcher Mike Piazza in the head with a fastball that resulted in a concussion and Piazza going on the disabled list. Early in Game 2, during Piazza's first time up, a Clemens pitch shattered Piazza's bat. The ball went foul, but a sharp edge of the bat came towards Clemens. He came off the mound and threw the bat towards the baseline, almost hitting the running Piazza. Piazza appeared baffled by Clemens' actions. After the game, Clemens would say he did not see Piazza running and threw the bat because he was pumped up with nervous energy and initially charged the incoming broken bat, believing it to be the ball. The Yankees struck in the bottom of the first when Mets starter Mike Hampton walked two with outs before RBI singles by Tino Martinez and Jorge Posada put them up 2–0. Scott Brosius's leadoff home run next inning made it 3–0. Martinez doubled in the fifth and, after an intentional walk, scored on Paul O'Neill's single. In the seventh, reliever Glendon Rusch allowed a one-out single to Posada and subsequent double to O'Neill. Rick White relieved Rusch and allowed a sacrifice fly to Brosius. In the eighth, Derek Jeter doubled with one out off of White, who was relieved by Dennis Cook and allowed an RBI single to Martinez. Clemens pitched eight shutout innings, allowing just two hits (both singles by Todd Zeile) while striking out nine. In the ninth, Jeff Nelson relieved Clemens and allowed a leadoff single to Edgardo Alfonzo before Piazza homered to make it 6–2. After Robin Ventura singled, Mariano Rivera relieved Nelson. He retired Zeile, allowed a single to Benny Agbayani and then, after Lenny Harris hit into a force-out at home, Jay Payton's three-run home run cut the Yankee lead to 6–5. Rivera struck out Kurt Abbott looking to end the game, and give the Yankees a 2–0 series lead heading to Shea Stadium. The Yankees' Game 2 win tied the longest AL winning streak in the World Series at ten games (the AL had previously won ten straight 1927–29 and again 1937–40). In Game 3, Robin Ventura's leadoff home run in the second off of Orlando Hernandez gave the Mets a 1–0 lead, but the Yankees tied it in the third when Derek Jeter singled with two outs off of Rick Reed and scored on David Justice's double. Next inning, Tino Martinez hit a leadoff single and scored on Paul O'Neill's one-out triple, but the Mets tied the game in the sixth when Mike Piazza hit a leadoff double and after a walk, scored on Todd Zeile's double. In the eighth, Zeile singled with one out and scored on Benny Agbayani's double. After Jay Payton singled, Mike Stanton relieved Hernandez and allowed a sacrifice fly to Bubba Trammell to pad the Mets lead. Closer Armando Benitez pitched a scoreless ninth despite allowing a leadoff single to Chuck Knoblauch as the Mets' 4–2 win ended the Yankees' fourteen-game winning streak in World Series play dating back to the 1996 World Series. Yankee hurler Orlando "El Duque" Hernandez earned the loss, snapping his previous undefeated postseason record of 6–0. Before Game 3, some analysts felt the tide had changed, that the Mets (down 2–1 in the Series) were now geared with enough momentum to make a comeback. That momentum lasted only until the first pitch from Mets starter Bobby Jones, which Jeter hit far into Shea Stadium's left-field bleachers. It was the 16th leadoff homer in World Series history, also extending a 13-game hitting streak in the World Series for Jeter. The Yankees added to their lead when Paul O'Neill tripled with one out in the second and .after an intentional walk, scored on Scott Brosius's sacrifice fly. In the third, Jeter hit a leadoff triple and scored on Luis Sojo's groundout. Mike Piazza's two-run home run off of Denny Neagle cut the Yankees' lead to 3–2, but neither team would score after that. The Yankees secured a dominant 3–1 lead in the Series, with elite pitchers Andy Pettite and Roger Clemens poised for Games 5 and 6 (if necessary). With this win, the Yankees had effectively killed all hope for the Mets. A now-iconic moment in Yankees lore, footage of Jeter's leadoff home run, currently serves as the background for the title screen of YES Network's Yankeeography series. Looking to clinch, the Yankees scored first on a Bernie Williams home run in the second inning. In the bottom half, however, with runners on second and third and two outs, Andy Pettitte's fielding error on Al Leiter's bunt attempt allowed the Mets to tie the score. Benny Agbayani's RBI single then put them up 2–1. In the top of the sixth, Derek Jeter homered to tie the game at 2–2. It was probably the most scared I've been when Mike hit that ball ... I screamed, "No!" Because any time he hits a ball in the air, it's a home run in my mind. I saw Bernie trotting over for that. I said, "Wow! I guess I misread that one." I remember it was a loud sound ... It was a pitch that got too much of the plate. It was supposed to be inside. I remember the swing, I remember Mo’s reaction. And then I looked at the ball and I see Bernie running after it, and then he stopped. And I’m like, O.K., we’re good. Game 5 was the final World Series game at Shea Stadium (1969, 1973, 1986 and 2000). This would also be the only time that visiting teams won a World Series at Shea Stadium (the Mets lost in 1973 in Oakland). This World Series provided some measure of revenge for Roger Clemens. He won the World Series in the same stadium he lost it at in 1986 while with the Yankees' fierce rival, the Boston Red Sox. Incidentally, members of the 1986 Mets World Series team threw out the ceremonial first pitch before the game. The New York City Subway promoted rapid transit usage for the 2000 "Subway Series." The D and 4 served Yankee Stadium and the 7 served Shea Stadium. 2000 would be the last World Series title the Yankees would win for nine years, though they would remain competitive each year. [note 2] They lost the 2001 World Series to the Arizona Diamondbacks in seven games and the 2003 World Series to the Florida Marlins in six games. The 2000 World Series was the last hurrah for this Mets core that consisted of Piazza, Leiter, Franco, Alfonzo, Ventura, and manager Bobby Valentine. After four consecutive seasons of competitive baseball,[note 3] the Mets would average just 74 wins in the next four seasons, including a 95-loss season in 2003 and two last-place finishes in the NL East (2002 and 2003). After 2002, Bobby Valentine and nearly all of the coaching staff were fired, and by 2005, Mike Piazza was the only remnant from the 2000 team; he would leave the Mets after that season. The Mets have made three postseason appearances since then. The first occurred in 2006, when they lost the NLCS to the eventual champions, the St. Louis Cardinals; the second came in 2015, as NL East champions, when they made a return trip to the World Series and lost to the Kansas City Royals (also in five games); the third took place in 2016 when they lost to the San Francisco Giants in the National League Wild Card game. This was the final World Series the New York Yankees won while playing at the old Yankee Stadium (as previously mentioned, they lost in 2001 and again in 2003) and the final World Series played at Shea Stadium. Both stadiums closed at the end of the 2008 Major League Baseball season. The first season at the new Yankee Stadium (2009) ended with the Yankees winning their 27th; meanwhile, the 2015 New York Mets hosted their first-ever World Series at Citi Field, where they lost to the Kansas City Royals in five games. Derek Jeter was the last active player involved in the 2000 World Series. He retired following the 2014 season. Some players, like Robin Ventura and Joe McEwing, currently work as coaches. The 1998–2000 New York Yankees established a record of ten consecutive games won in consecutive World Series. The previous record was nine by the 1937–1939 Yankees. Overall, the Yankees had won fourteen straight World Series games (starting with Game 3 of the 1996 World Series) breaking the mark of twelve straight by the 1927, 1928 and 1932 Yankees. Mariano Rivera became the first and, to date, only pitcher to record the final out in three straight World Series. In 1998, he retired the Padres' Mark Sweeney to clinch the championship; in 1999, he retired the Braves' Keith Lockhart; and in 2000, he retired the Mets' Mike Piazza. 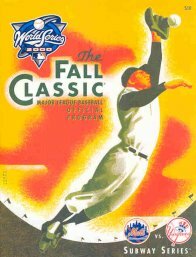 The World Series telecast on Fox was the first year of their exclusive coverage of the Fall Classic (although the new contract would technically begin the next year). As in previous World Series televised by the network, Joe Buck provided the play-by-play with Bob Brenly and Tim McCarver (himself a Yankees broadcaster and a former Mets broadcaster) as color commentators. Game 5 of the series was Brenly's last broadcast for Fox, as he left to become manager of the Arizona Diamondbacks and, incidentally, go on to defeat the Yankees in the World Series the following year. Brenly returned to broadcasting in 2005 as part of the Chicago Cubs broadcasts on CSN Chicago and WGN, and also has called postseason games for TBS. ESPN Radio's coverage was without Joe Morgan for a second consecutive year for reasons that remain unclear. Instead, Jon Miller shared the booth with Dave Campbell, ESPN Radio's Sunday Night Baseball color man. In 1999, Morgan was absent from ESPN Radio's World Series coverage because he was working the television broadcasts with Bob Costas on NBC. During Game 3, Miller was forced to leave the booth after the top of the first inning due to an upper respiratory infection. Charley Steiner, serving as a field reporter for the network, filled in on play-by-play for the rest of the game; Miller resumed his duties in Game 4 of the Series. The World Series drew an average of 12.4 national rating and a 21% share of the audience, down 22.5% from the previous year. The Series drew well in the New York metropolitan area, but nationally, it was, at the time, the lowest-rated World Series in history by a solid margin. Many contemporary analysts argued that the ratings slide was due to lack of interest outside of New York City. Others thought the ratings slide was related to the television viewing audience becoming more fragmented in the wake of cable television. Online streaming media services were in their infancy and were a non-factor in 2000. Three of the next four World Series (2001, 2003 and 2004) were all rated higher than the 2000 World Series. Following the Boston Red Sox' 86-year championship drought ending with a victory in the 2004 World Series, the event has seen a decline in ratings; every World Series from 2005 to 2013 has drawn lower ratings (sometimes substantially lower) than the 2000 Series. ^ The 1997 Indians won 86 games, the 1987 Twins won 85 games, and the 1973 Mets won 82 games. ^ "2000 World Series". Baseball-Reference. Retrieved January 6, 2014. ^ "2000 World Series Game 1 - New York Mets vs. New York Yankees". Retrosheet. Retrieved September 13, 2009. ^ "2000 World Series Game 2 - New York Mets vs. New York Yankees". Retrosheet. Retrieved September 13, 2009. ^ "2000 World Series Game 3 - New York Yankees vs. New York Mets". Retrosheet. Retrieved September 13, 2009. ^ a b "2000 World Series Game 4 - New York Yankees vs. New York Mets". Retrosheet. Retrieved September 13, 2009. ^ "2000 World Series Game 5 - New York Yankees vs. New York Mets". Retrosheet. Retrieved September 13, 2009. ^ "Sports - Champions belong in any discussion of greatest teams - Seattle Times Newspaper". ^ "Timeless Sport's Final Moments". The New York Times. November 3, 2009. ^ "Rivera and Rest of Pen Did Job When Needed". The New York Times. October 27, 2000. ^ "Mariano meets with Mets fans, employees". ^ "Yanks' fans celebrate as Mets' mourn". USA Today. October 27, 2000. p. 6C. Briefly: Members of the New York Mets' 1986 World Series champions—catcher Gary Carter, first baseman Keith Hernandez, outfielders Lenny Dykstra and Mookie Wilson and pitcher Ron Darling—took part in the ceremonial first pitch. ^ Graves, Gary (October 27, 2000). "Mets invoke grit of 1986 champs". USA Today. ^ Salisbury, Jim (October 27, 2000). "Ex-Phillie Dykstra Still a Mets Dude". Philadelphia Inquirer. p. D1. ^ Zipay, Steve (October 26, 2000). "Going Yard, Off Guard". Newsday. ^ "Subway Series is lowest-rated Fall Classic in history". CNN. ^ "2000 Yankees World Series Collector's Edition". Home Theater Forum. The subway series: the Yankees, the Mets and a season to remember. St. Louis, Mo. : The Sporting News. 2000. ISBN 0-89204-659-7. History of the World Series - 2000 at The SportingNews. Archived from the original on 2008.